We headed to University Oval to face Blacks with plenty of motivation – firstly, to maintain a position in the top four and secondly, to celebrate club stalwart Frank Pickett’s 150th game. We beat Blacks earlier in the season by just three points and we know they are a very combative football side. Added to this, the tricky wind conditions was going to make it a tough day. We started well kicking three goals one in the first quarter. There was some positive signs of improved ball movement and some run & carry. Blacks fought back in the second term and whilst they only had few inside 50’s were able to score too easily and we only held a four point lead at half time. The second half was highly competitive & combative footy. Both sides applied plenty of pressure on the ball carrier. Sam Williams laid a season high 21 tackles, an amazing effort. Jake Gotch continued his terrific form and complemented his game with two quality goals and Tom Humphrey negated one of the best small forwards in the comp. Our small forwards, led by Ed Clinch, Michael Griechen & Scotty Vawser made sure there was pressure to lock the footy in our forward half. Sean Fisher worked himself back into some form and continually gave the smalls a chance at ground level. Ant Forato (14 tackles) played his best game for the year. There was a number of last quarter heroics, Chris Robinson did some terrific work whilst David Convery was typically tough to outmark when it counted. Blacks never threw in the towel and the result could have easily gone their way. To our lads credit, we withstood everything and with three players unable to see out the game, we really showed some courage. This is the ninth time we have kept our opponent to 10 goals or less, a great reflection of our improved team defence. Our challenge is to find more avenues to goal in the final four games. Getting over the line by a solitary point ensured we stay in the top four. We have the bye next week then play Trinity at home. Wow, what a day – a tough day for the two’s. To be honest, I don’t know where to start… So this will be brief – Uni Blacks 9.18.72 defeated DeLa 0.0.0. As bad as it looks, I thought our boys worked as hard as they could. For us not to score was poor, but to keep them to nine goals shows me there’s some fight in this group. We want to be as positive as we can. Uni Blacks had 12 inclusions to their side this week and no doubt that helped their cause. Each week we see players improve their own games. Again, Luke Williams, Liam Bisognin, Tyson Parker and Harry Morris worked their butts off. Mason Martinez continues to be impressive. It was good for the three Morris Boys to play their first game together. We thank the three under 19 boys who helped out today, they can hold their heads high. Going forward we can only ask the lads to continue to work. With four games to go, opportunities will present themselves. I’m looking forward to seeing how we respond. Again we were faced with tough conditions as we took on Parkdale at home. Having suffered a loss to them in our previous meeting, we were looking for redemption. Kicking with an extremely strong wind in the first quarter, we were wasteful. Our ball use was poor and besides the first five minutes, our intensity was low. Parkdale took their limited opportunities and were able to kick two into the wind while keeping us goalless. That left us with a tough challenge ahead in the second quarter pushing into the wind. Defensively we were strong for the entire 25 minutes, keeping them to one behind and scoring a goal ourselves. Parkdale took a one point lead into the major break. We changed things up at halftime and encouraged the boys to be ‘handball happy.’ Disposal by foot was extremely difficult so we opted to possess the ball by hand with the wind. To the boys credit they followed instructions and were rewarded with five goals while keeping the opposition scoreless. O’Callaghan and Mackie lead the way on ball, while Hawker was dominant in the air and Fasoulis clever around goals and O’Connor was also among our best. The last quarter wasn’t pretty, but it was workman like. We hung tough against the wind and kept it tight and congested all quarter. In the end we had a comfortable 21 point win in really difficult conditions. We look forward to our next challenge against a fellow top four team in Old Xavs. Due to the vagaries of the draw, the Golds had a bye this week which was helpful given it’s flu and cold season. The week off allowed a couple of the lads to have a week off and get over being ill.
That said, it was great to see the boys come down and support the Colts by being water boys, runners and match day helpers. In addition, we were then able to give a few of the lads a run in the reserves as they are battling a huge injury list. Credit to Josh Galbraith, Pat Cook and Cooper Morris (who had the opportunity to play with his brothers Harry and Lachie for the first time). By all accounts the boys acquitted themselves really well in a very young side which had a hard day at the office. This week the Golds take on old nemesis Old Xaverians at Waverley in a battle for the top two. The equation is simple – lose and we’re in a dogfight of three teams chasing a top two spot, win and we get a mini break over them in the run up to finals. Final scores: De la Salle 0.0.0 defeated the bye. It was an early start out at Ted Ajani Reserve, with the girls asked to arrive at 8.10am. We needed a huge win of over 120 points to have any chance of playing finals. We kept the instruction simple – play on at all costs. Take the game on and never stop running, but after no one scored in the first quarter, our finals dream was over. A much better second quarter with good link up footy had us 2.1 up to zero come the main break. Mary Luong scored a great goal and Claire Clarke kicked one from long range. First gamer Anne Jessup was having an impact on the game and enjoying being part of the team. Carle’ Rooks was being tagged heavily and we were being forced into stoppage after stoppage… Not how we like to play. Heavy tags and stoppages continued and we only kicked one point for the quarter to Bulleen Temp’s 1.4. It was four points the difference coming into the last break and we had a strong breeze to look forward to. To Bulleen-Templestowe’s credit they fought the game out hard and we needed to dig deep to get the four points, eventually winning by 17 points with a goal on the siren. It was great to see another win as we finish off the season. Jacq Enberg had another solid game and ran hard all day. Brooke Robertson had a best on ground performance and the Weltner sisters were dominant at both ends of the ground. With the season over for the Guns, we now focus on 2018 recruiting and it’s a fantastic result that 30 girls have committed to next season! Not a pretty or skilful game of footy for our supporters to watch, but a win that was so sweet and full of courage. As has become the norm in the last few weeks, we have played poorly early and then rallied when things seemed beyond hope and almost gone. With a fierce wind favouring the scoreboard end it was still a day when kicking goals was tough. We were in dire straits trailing by a point at the last change and kicking into the gale. The boys had a steely look of determination at three quarter time and there was a sense they could pull of a remarkable win. We defended really well early and slowly began to get on top of the opposition. The ball spent the majority of the last 20 minutes in our forward line, the harassment and pressure applied to St Bede’s didn’t allow them any easy ball and when they did go forward, a well organised defence repelled their infrequent assaults. The game was in the balance until the final minute when our continual relentless pressure allowed Tom Vance to kick the game winning goal. Our defensive pressure was huge and pivotal in the last quarter, applied not only by our mids and small forwards but our tall forwards who worked tirelessly to retain possession. Again we waited very late into the game before we ran and carried the ball, using our hands a bit more to gain vital yardage. Some great defensive and courageous marks were highlights of the last quarter, but one in particular late by Lachie Armstrong was stirring. The pressure applied all over the ground resulted in the boys having seven shots at goal into the gale for a return of 1.3 to amazingly keeping St Bede’s scoreless! Standout players were Cam Roberts and Lachie Armstrong but when the game was on the line in the last quarter everyone played a significant part in recording a memorable and season defining win. We need to take the momentum built when we take on fourth placed Williamstown next week. Another week and another total team performance from the Dino’s. 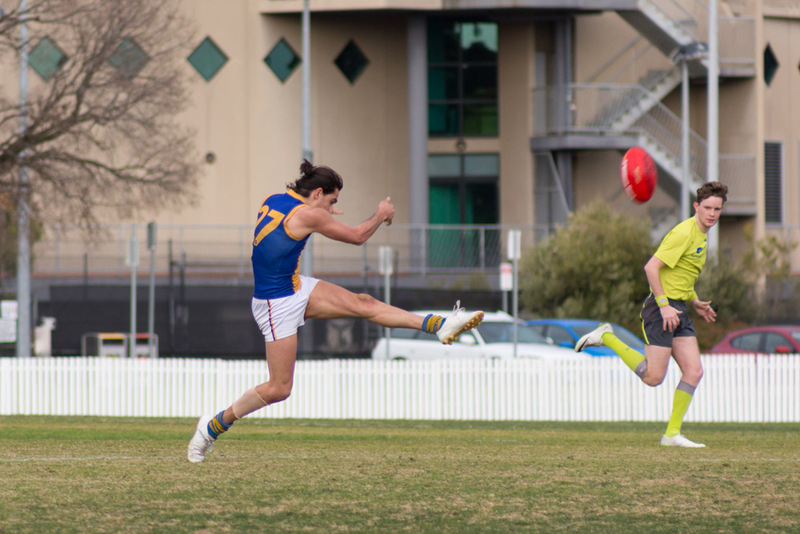 Those who had some free time on Sunday and came down to Waverley Oval were served up a very competitive game of football. St Kevin’s have been one for the form teams since a Round 1 defeat to the Dino’s and with both teams seemingly headed towards a final match up, there was a bit of finals atmosphere about the game. The Dino’s came out running early on. The Great Ben Mannix came aboard and instantly provided a spark in the forward line, in particular delivering a one-handed grab to the delight of the crowd. Captain courageous Phila also showed enormous courage taking a strong grab and a whack to the back of his head to put the Dino’s up by two goals at the quarter time break. The second quarter was pretty much all St Kevin’s who shut down the Dino’s running game, and the Dino’s trailed at half time for one of the few times this season. The magnets were moved at the half time break and the team went to work in the second half. Troy, Farms, Iggy & Tilly providing plenty of drive and hardness at the footy when it counted the most. Down back it was the usual combination of BC, Macca, Pauley and Cam holding strong. JB and Marks both made an impression on their respective wings whilst up forward, Higgo (who couldn’t buy a free kick), Chapps, Newman and Miller put a score on the board. When the final siren went the Dino’s advantage was 13 points. SPECIAL MENTION: Glenn Wadley suffered a bad knee injury just before half time. Waddles has been involved with the Dino’s from the very beginning and is a very popular teammate. Anyone who has spent any time around the Dino’s knows how respected Waddles is and how much the Dino’s means to him. Waddles is a ‘heart and soul’ type player and no one would be surprised if he is still at training Thursday night (bad knee and all) getting around the boys. Our final home and away game is on Sunday 13 August against Brunswick at Waverley Oval. Can the Dino’s go undefeated??? Get along and check us out! !